In 1961 Norman Greene approached President Lawrence Pelletier with an inquiry about establishing a radio station. 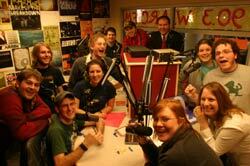 A student survey had shown almost unanimous student support – enough, Greene believed, to constitute a mandate. Yet Pelletier’s reaction was none too promising. “It was like ‘Oh, God, not another radio station! '” Greene recalls. Pelletier’s fears were not unfounded. Thirty years earlier Allegheny’s initial experiment in radio had fizzled. The administration saw little reason to believe this one wouldn’t fail as well. To make a campus radio station a reality, Greene had to raise thousands of dollars, rally student support, and assuage faculty fears. Future governor Raymond Shafer ’38, then the College’s attorney, agreed to handle legal matters. But not even he could overcome the mountain of red tape. Greene personally drove to Washington to talk to the FCC. At one point, the Allegheny charter came under dispute and the government wanted proof that Allegheny founder Timothy Alden was dead. In his desire to leave no one out of the project, Greene invited input from students and faculty, including Dean of Students John McKean, who had strongly opposed the project. Greene saw the station through its hectic first year and graduated in 1964, going on to a career in public relations. He is now co-publisher of the San Diego Jewish Press Heritage. The station recently celebrated its fortieth birthday with a new location in the Henderson Campus Center, where it has come a long way since Greene built it from the ground up. Faculty no longer oppose WARC. Rather, they have programs on it, like English professor Kirk Nesset, who plays goth metal for, as he bills the program, the “depressed, the dispossessed, undernourished, and unforgiving.” He sits alongside students who play an eclectic mix of programs ranging from Richard Palmer’s rock station to WARC manager David Podboy’s experimental station. But in all the hustle, nothing is lost. 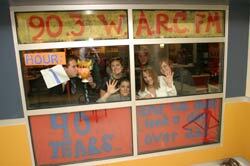 In Norm Greene’s San Diego office is a framed copy of the WARC dedication issue of the Campus, showing that he has not forgotten his radio station. And over Podboy’s WARC desk is a picture of Greene himself, showing that, forty years later, WARC has not forgotten Norm.